One of Jim's career highlights was headlining a breakthrough concert at New York's famed Carnegie Hall. Also on the show were other Grand Ole Opry stars, shown arriving here with Jim. From the bottom of the ramp upward are Faron Young, Minnie Pearl, Grandpa Jones, Jim, and Bill Monroe (in doorway). Not pictured but also on the show was Patsy Cline. 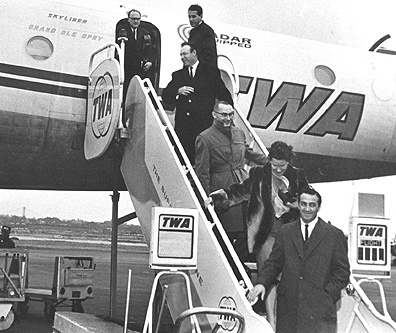 The group flew to New York on a TWA plane renamed "Grand Ole Opry Skyliner" for the occasion (see markings upper left).